Richard Brown sent me a list of news items about this area in December 2015 and a January 2016 update. These are further updates for May, July, September and December 2016, February 2017, April 2017, January 2018, February 2018 and September 2018. Note that owing to my incompetence the updates from the first half of 2018 were only added in September 2018. The latest update is for March 2019. UK citizens should note that while Tikhoretsk is not 'listed' by the Foreign Office although visitors should check the status of places mentioned below before travelling there. This is the March 2019 update. During December 2018, all three local FD's, 1562, 1679 and 2109 were present at Tikhoretsk. Work has started on FD-2109. The cab sides have been repaired along the bottom edges and new cylinder cladding fabricated and fitted. The general condition looks good, considering it was outside for 30+ years. YeM-3747 has been completed and has been delivered to the North Caucasus Railway. It is in use in manouvres in the Tikhorestk area and also on local retro trains, which are usually Rostov to Taganrog. Incidentally, on most days there are two steam locomotives rostered for work in the Tikhoretsk area, either being used as shunters or on local freight workings. Most of the reserves of the L class belonging to Russian Railways seem to be being concentrated at the Roslavl II reserve base (Google Earth Lat. 53°54'58.04"N, Long. 32°58'32.73"E). There were no less than 36 here on 27/05/2018 and by now there will be more. On 17/05/2014 there were only 12 L's here. Five more were being moved there on.04/03/2019: https://www.parovoz.com/newgallery/pg_view.php?ID=638141&LNG=EN#picture from the Bureya reserve base in the Amur Oblast in the Far East of Russia. There are also L's at Bogotol near Krasnoyarsk (GE Lat.56°11'53.79"N, Long. 89°47'7.24"E). There were 11 there on 29/04/2018. On 12/02/2019 L-3228, L-3426, L-3435, L-3482, L-3486, L-3540 & L-5270 were present. Judging by evidence from this article: https://feelek.livejournal.com/117544.html (from 2014) at least one of the residents (L-5145?) was in working order; note the shiny condition of the firehole door handle. Bogotol may hold the reserves for the steam services around Lake Baykal which are centred on Slyudyanka (GE Lat. 51°39'25.22"N, Long. 103°43'42.55"E). Current locos used are L-3438, L-3485 & L-4253. The latter was used as a stationary boiler at Zlatoust between 2005 and 2007. Locomotives for this service are overhauled at Troitsk. L-4253 was in store at Onokhoy Reserve Base (now empty of L's) in 2012: https://www.parovoz.com/newgallery/pg_view.php?ID=378595&LNG=EN#picture , at Troitsk in 2014 in a very woebegone state: https://www.parovoz.com/newgallery/pg_view.php?ID=495230&LNG=EN#picture . Here it is during overhaul: https://www.parovoz.com/gallery/RU74/20151121_541039.jpg and on its way to Slyudyanka: https://www.parovoz.com/newgallery/pg_view.php?ID=553636&LNG=EN#picture . Tikhoretsk has acquired a 200 ton press for dismantling P36 and LV wheelsets to allow replacement of roller bearings and a vertical boring turret lathe to allow the turning of the ID of new locomotive tyres up to a maximum diameter of 1850mm - large enough for P36 and SU locomotives. This means that Russian Railways finally have the capability to replace steam locomotive tyres and roller bearings. It is planned to use the following locomotives for the GW Travel tour starting from Moscow on 1st October 2018 - P36-0027/0110/0120/0218, LV-0233/0283, L-0073/5259, SU-250-64, SU-252-20, FD20-1679 (actually FD20-1562), TE-322, EM-3747 and ER-769-17. Apart from the three Moscow-based P36's, all locomotives are based in Tikhoretsk. P36-0147 has arrived in Tikhoretsk from Sharya, Kostroma for restoration to working order. This was intended to be the last P36 to be restored to working order. However, the surprising arrival of another FD in Tikhoretsk for restoration must put this in some doubt. This is FD20-2109 which has been on display at Kamenolomni depot (north of Rostov) since the 1980's. It is to be restored with smoke deflectors. LV-0123 and SU-252-20 were both steamed for the first time during the last week of January. Both had taken longer to restore than allowed for because of their state of repair. Both were incomplete, for instance the SU's regulator rod was missing for some reason and the entire cab needed replacement because of corrosion. The LV was more complete but lacked a grate and also required some platework replacement in the cab. The repair of YeM-3747 has started. No news of TE-322 or YeA-3510 although the latter's restoration is funded. LV-0522 from Moscow is at Tikhoretsk for overhaul. The tender is on jacks, drivers are being turned on the ground lathe and firebox repairs are taking place. The last five are speculative. There are funds allocated for the last three but I'm not sure about the Y's. So with two P36's from Moscow, they should manage 21. Crews might be more of a problem! Moscow to Saratov, Astrakhan, Grozny, Vlakikavkaz, Kislovodsk, Pyatigorsk, Sochi, Krasnodar, Rostov, Volgograd and return to Moscow. Entirely steam-hauled, or at least promised. Using most of the Tikhoretsk fleet with two P36's from Moscow. Tikhoretsk must be working on the TE and at least one (or two) Y's at the moment. With a price to match! No news on where it is destined to be used. LV-0522 is due to arrive from Moscow for repairs. https://www.youtube.com/watch?v=aKdjgDiKRuk published in June 2017. Note that the shots of the L's in the yard, shown towards the end, must have been taken before the workshop views because L-2055 is shown being overhauled. L-2055 is mis-identified as L-0073 in the video; the outline of the number can be seen on the cabsides as well as "L-2055" written on two new covers on the cylinders. The state of FD-1679 dates the workshop scenes as the first half of 2015 and L-0073 would have been much closer to completion at this point, if not finished. At the beginning of March, (Kriegslok) TE-322 was transported to Tikhoretsk for restoration to working order. It last worked in 2002. Work continues on SU252-20. Valve chests and cylinders are all being bored to make good damage done by precipitation over the 30 years it was out in the open. On 20th March 2017, LV-0123 was on jacks with freshly turned tyres underneath. The overhaul of L-4372 from Perm was recently completed. It has now left Tikhoretsk. P36-0110 is in the final stages of overhaul. Painting is nearly complete. It will be green with red stripes. P36-0147 will be the next P36 to be overhauled and also possibly the last. P36-0110 has been test steamed but has yet to be painted. It will be painted green with red stripes. The next P36 to be overhauled at Tikhoretsk is 0147.
but I've never seen any evidence that it was subsequently steamed. I say most because some, like L-0029, have tyres that are too thin. It was stored for a long time in Sergach and St Petersburg. It's condition on arrival at St. Petersburg was poor, essentially equating to Barry condition but largely complete. It has received a new cab and boiler cladding but will now be dismantled for restoration to working order. Work continues on SU252-20. Currently the valve chests and cylinders are being bored. L-5282 has returned to Tikhoretsk from Crimea (along presumably with L-2055). SO18-2018 has had a new front tubeplate fitted and has been converted to coal firing. It appears to be finished but is still at Tikhoretsk. SU252-20 is having a new cab fitted. Cladding has been trial fitted to the boiler barrel. For some reason, progress seems to have slowed. The tender appears to be finished, including painting. L-0074 has been conserved with a coat of paint. 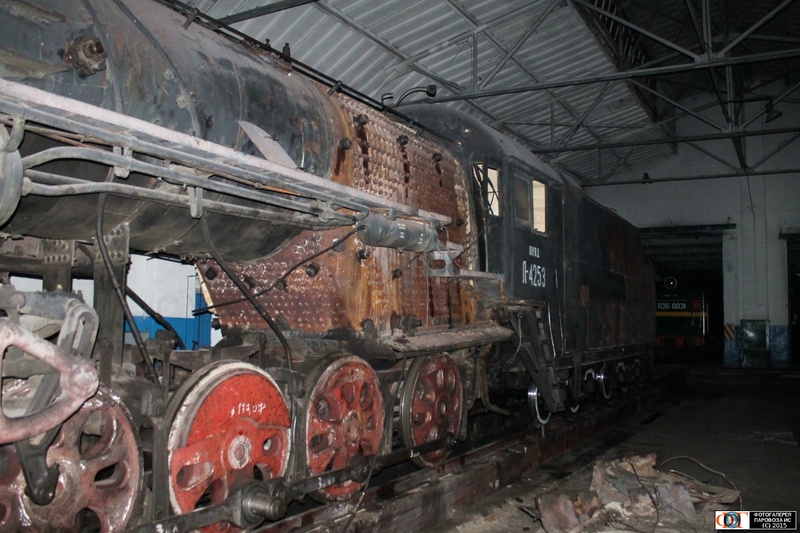 EY709-84 is at Tikhorestsk (from Rostov Museum), which might mean that it is to be restored to working order. An epic journey was made from the Far East of Russia to rescue US-built YeA and YeM 2-10-0 locomotives over last Winter. All were 100% complete except for YeA-2735 which lacked a grate and one injector. These included YeA-2577 (for the museum in Chelyabinsk), YeA-2735 (Samara Museum), YeA-3113 (Yekaterinburg Museum), YeA-3560 (St Petersburg Museum), YeM-3747 (restoration to working order at Tikhoretsk), YeM-3753 (for repair to working order at Troitsk and return to Komsolmolsk) and YeM-4239 (for restoration and to Rostov Museum). The quality of repairs at Troitsk is apparently not rated highly by Tikhoretsk! The train also included a 1940 coach as crew car (with generator, coal-fired stove and even TV!) which was originally built as an ambulance carriage; this will be restored and displayed in Rostov Museum. The journey started in Komsomolsk-on-Amurr (13th December 2015), then via Urgal, Krasnoyarsk, Novosibirsk, Omsk (3rd January 2016), Chelyabinsk where YeA-2577, YeA-2735 and YeM-3753 were dropped off (6th January 2016). YeA-3113 was left in Yekaterinburg (8th January 2016). Then to Ufa and Syzran where YeA-3560 was dropped off (11th January 2016). Tikhoretsk was reached on 15th January 2016. At Tikhoretsk, LV-0123 has arrived in a very rusty state from Shumkova reserve base, Sverdlovsk, for restoration to full working order. LV-0233 is on jacks with all drivers removed for scheduled maintenance. This is the July 2016 update. A new working steam museum is to be established in Chita in the east of Russia, on the Trans-Siberian. This is a possible destination of P36-0110 (under restoration at Tikhoretsk). Tikhoretsk has also just received three further locos for restoration to working order for this museum, ER-750-10, ER-743-31 & EU-713-31. The latter three had been stored in the open at Rostov for 20 years without any movement but arrived at Tikhoretsk by rail without any problems! P36-0120 has recently returned to Tikhoretsk for repairs, again! L-2055 has been converted to coal firing although it's not clear when this occurred. L-2055 & L-5282 are still in Crimea. L-5282 is still oil-fired but seems to have a new oil tank! Work continues at Tikhoretsk on SO18-2018 & SU-252-20. Work on the firebox of the latter appears to be complete. Work on P36-0110 has yet to start. The ground lathe installation at Tikhoretsk is now complete. P36-0120 returned to Tikhoretsk in March along with LV-0182 for tyre turning. There are uncomplimentary comments locally about the footplate staff in Moscow concerning the frequency of the requirement for tyreturning to be done. This would seem to be a serious problem considering that Russian Railways don't currently have the capability to replace large tyres. SO18-2018 is also at Tikhoretsk for repair, again with negative comments about the St Petersburg footplate staff. There was a damaged piece of the motion that cannot be repaired. Work continues on SU252-20. The time allotted for restoration is half that for the FD. The reason: it is half the size! The mystery of L-2055's disappearance is solved. Apparently it was in the Kyrgyz Republic but I'm not sure why. L-5282 was also there in 2015. The Kyrgyz Republic has only 370km of track. The same pair left for Crimea in early April, presumably in a bid to promote tourism. They were shipped on the ferry to Kerch.